Outdoor digital menu boards help in the ordering process, create a dynamic way to promote specials and limited time offers, and increase a Quick Service Restaurant’s (QSR) bottom line. With any new project, the overall goal(s) is the very first item that should be considered. The goals can be any of the following: increase customer engagement, raise revenue, or create brand loyalty. Depending on the goal(s) set will dictate the QSRs overall content strategy. Do not move forward with the project until the goals have been defined and are clear to all parties involved in the project. Digital boards must be updated with fresh and relevant content, on a regular basis, to maximize your investment. Will your restaurant be able to handle the demands of updates? Failing to not properly prepare for the digital menus can be a colossal mistake. 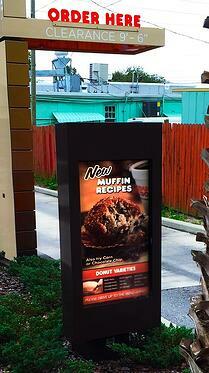 After setting the goals, determine the number of stores that will utilize digital menus. Deciding on the number of locations will help negotiate the best cost for the necessary hardware and software. Many companies will discount products based on large roll outs. Therefore, there will be a big price difference between 1, 25, 100, and 500 stores. A QSR may want to test a few markets, based on environmental extremes, to evaluate the ruggedness of the solution. The overall project goals will dictate what hardware is necessary. If the goal is to highlight promotional items to increase revenue, consider installing a presell board in the drive-thru. If the goal is to easily update menus with FDA guidelines and to have the ability to daypart, then a full digital menu board will be the best option. And, then, comes the most important aspect: research, research, research! There are a number of companies, on the market, that claim to provide outdoor solutions, but have never actually deployed them in an exterior environment! The ‘solution’ may be a few ‘Photoshopped’ images that were doctored up using some dynamic stock imagery. Be wary of these providers and always ask for references. Inquire where you can see the actual products deployed at a quick service restaurant near you. Seeing is believing! Site surveys are generally very inexpensive given the cost of installing new equipment in a drive-thru. Surveys usually cost under $500 and will provide a great deal of insight into how smoothly the installation will progress. If planning on installing multiple stores in a metropolitan area, you will likely be able to negotiate a better rate per survey. A number of items are discussed during the site survey, which include an evaluation of the existing footer, cabling and data wiring, and de-installation of current signage.